Yikes! It’s been almost a month since I last posted (and did any coloring)…how did I let this happen! Oh well…time to get back on track with coloring on a regular basis. So the last two days I finally had an opportunity to do some more coloring and in the process, I finished this version of “Fly Away With Me.” Yay! Now that it’s done, it has a bit of an MC Escher look to it. I definitely want to do more of this style of coloring. 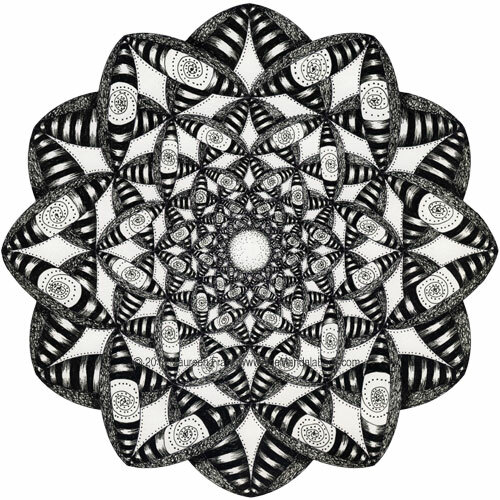 I think I’ll do one of the hyperbolic tessellation ones next…they have lots more detail. With yesterday’s coloring, I recorded me coloring in one of the outer sections so you could see the process.